For the past few years I’m been making (and perfecting!) my own do-it-yourself sunscreen/sun tan lotion. After reading reports about store bought sunscreen being linked to cancer (and the fact that sunscreens typically have a long list of unknown ingredients) I was all about trying to make my own. Read one such report from the Dr. Oz show here. Wellness Mama was one of the first recipes I used and after doing some more research I’ve tweaked it to make it my own. The recipe is at the bottom of this post, but first I’ll explain why I included each of the ingredients. 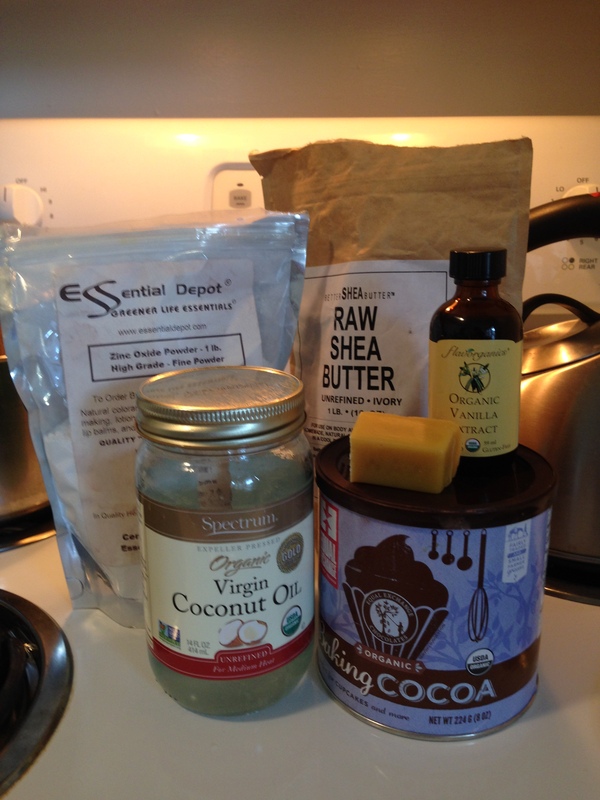 Coconut Oil, Shea Butter & Beeswax: used to make the lotion base. Coconut oil actually has a natural SPF of about 4 (there’s a fun fact for y’all!). Vanilla Extract: is optional. You could add this or other essential oils depending on your preference (Warning – do not add citrus essential oils like lemon, grapefruit, orange, etc. They are not to be added to lotions used in the sun). 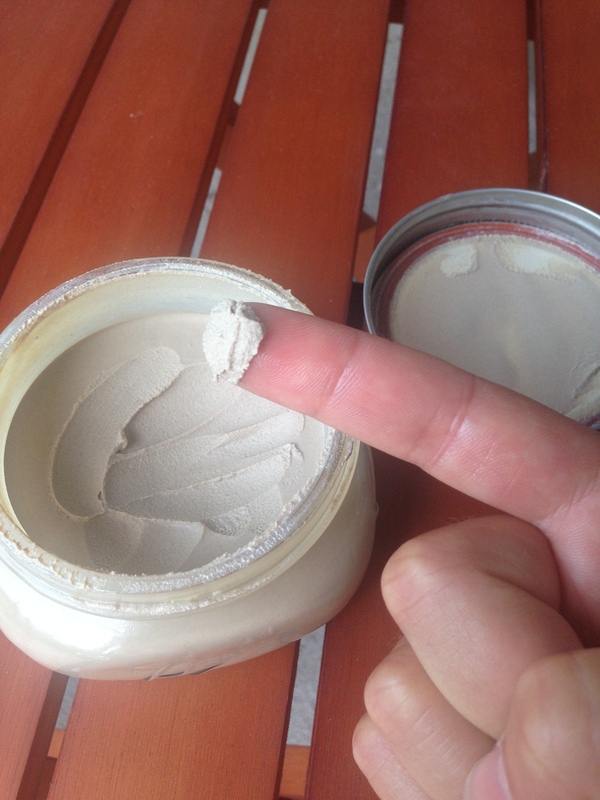 Zinc Oxide: is how you get the SPF in the lotion. I’m not exactly sure what SPF this amount makes but this chart might help you. Make sure you buy a non nano version so the particles do not enter your bloodstream through the skin. I buy mine from Amazon. Cocoa Powder: is optional. It helps to tint the sunscreen. I never used cocoa powder in the past but the sunscreen always left a white/yellow tint (especially on Mike’s stubble/beard) so I decided to try it out. 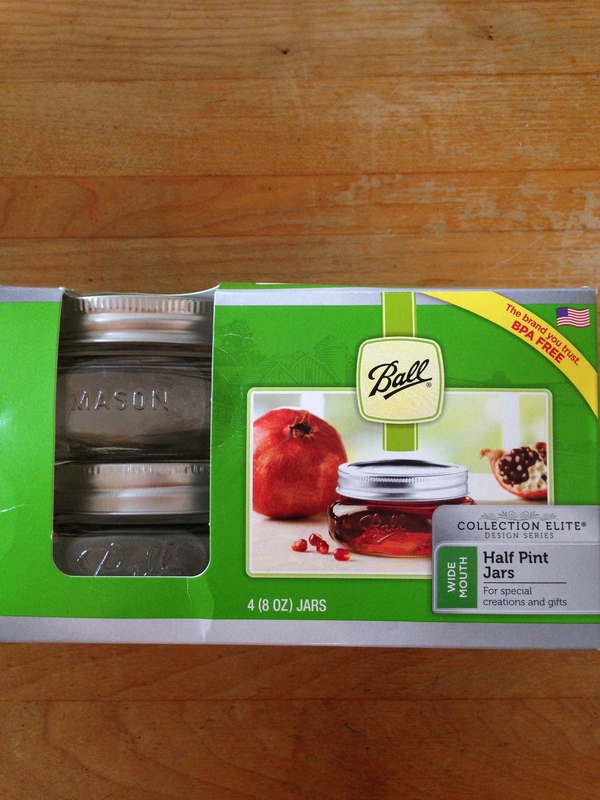 Put first four ingredients in a mason jar (or use an old pickle jar). Keep the lid loose. Put in a saucepan that is filled with a couple of inches of water. Turn on medium high heat. 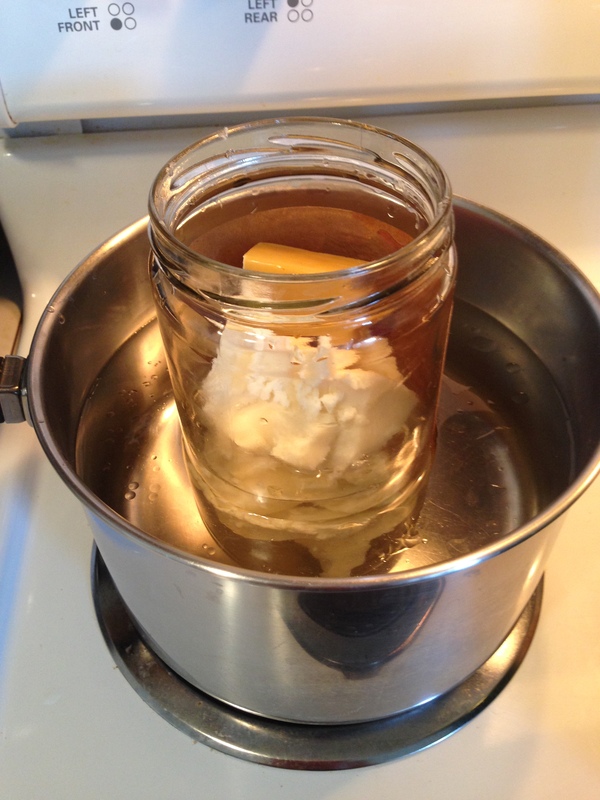 While heating, shake or stir the jar frequently. When all the ingredients are mixed add the zinc oxide and cocoa powder. Stir/shake. I put on oven mitts, closed the jar’s lid and shook it over the sink. 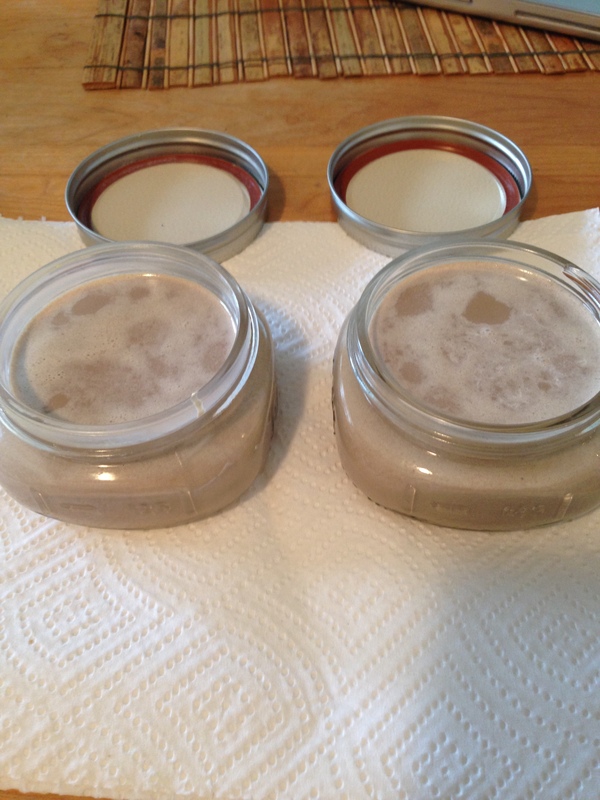 Pour into mason jars (I used the 8oz wide mouth jars – these make it super easy to get the lotion out once it cools). I stir mine a few times while they cool to make sure all the ingredients are evenly mixed. To hurry up the cooling process I put mine in the fridge (after they’ve cooled on the counter for about an hour or two). Make sure to reapply this lotion (depending on how long you’ll be outside, the strength of the sun’s rays, etc). Now go out and enjoy some natural Vitamin D! 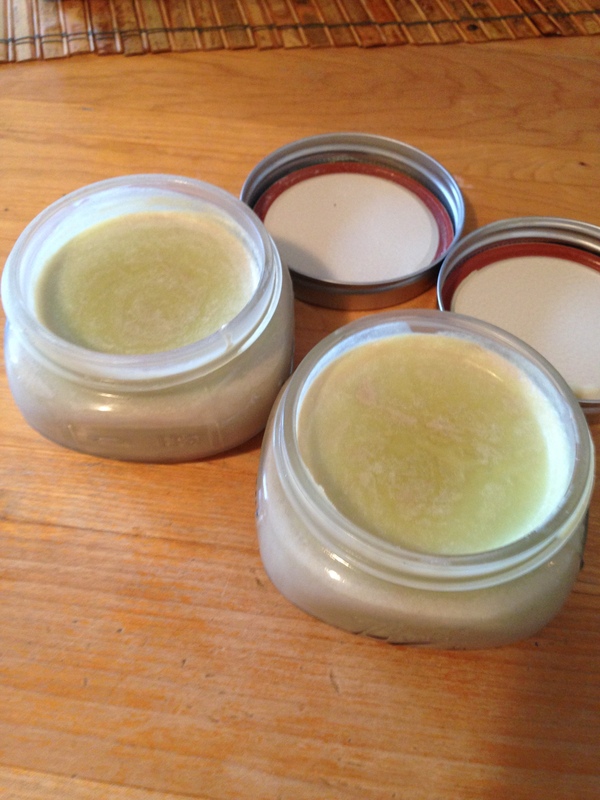 Have you ever made your own sunscreen before? If so, what are your tips and tricks? I’d love to hear from you guys! Welcome back to the blog world! I’ve also been gone for a few months and hope to get back to it. I look forward to reading and seeing pictures of North Carolina! Thanks Linda! For the past few years it was crazy starting a second career as a teacher so I put the blog on hold…but I couldn’t stay away for too long 🙂 Thanks for reading!